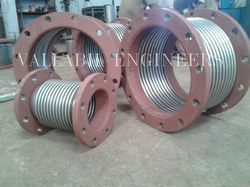 We are a leading Manufacturer of bellow and flexible bellows from Vadodara, India. We are offering wide range of Industrial Expansion Bellow, these are known for their unmatched quality and unbeatable price in market. These are developed using quality tested raw metal that is procured from some of the trustworthy and licensed vendors of the industry. Our manufactured Metal Bellow is high in demand by the clients. These are duly tested by our experts on various quality parameter. The simplest type of expansion joint consists of a single bellows element, which is welded to end fittings, usually flange or pipe ends. These are available at very reasonable price in market.Metal Bellow can withstand high pressure and temperature up to 600 Deg C.